Exercising her prey drive with an interactive play is a crucial part of your cat’s development and contributes greatly to her quality of life. When using an interactive toy such as a feather wand or a mouse on a string, move the toy like the prey it’s supposed to represent. When birds aren’t flying, for example, they hop around on the ground and then flutter off to land somewhere else. Mice and other rodents scurry with sudden starts and stops, keeping to corners and hidden places. If you’re really serious about learning to play like prey, watch them at work in your yard or study videos of their behavior. When she meows, do your best to respond with exactly the same sound. Keep echoing her as she moves from verse to verse. This is a great way to maintain contact with the cat as you go about other chores, such as scooping the litter box or preparing the meal. Tossing a treat on the floor in front of the cat won’t do anything to stimulate her mind or her hunting instincts. Cats actually enjoy working for their food. The cat will have to either pull the treat out of the cup with her paw or knock over the cup. Either way, she’s thinking and working. Cats’ natural life cycles generally consist of hunting, eating, and then sleeping. Playtime before supper can encourage a good appetite. If your cat tends to wake you up in the middle of the night, a 15- or 20-minute play session before you go to bed can help your cat sleep through until morning. Tailor the play to your cat’s own rhythms, though; if she gets the zoomies shortly after she eats, why not accommodate her with an after-dinner game of Chase the Mouse? It’s really important to let your cat “catch” her prey during the play session. Otherwise, she will get frustrated and either stop playing with you or act out in response to her unfulfilled urges. If you play with a laser pointer, be sure to have some kitty play sessions with a toy she can catch, too. Indoor cats crave novel experiences, and they read the outside world when they sniff something new. After sniffing may come some rubbing (scent marking), and the cat is also likely to sit on the object, if possible. These behaviors are part of the cat’s efforts to incorporate the novel object into her territory. If you crumple up a piece of junk mail, even better – you’re adding some auditory fun. Cats often locate their prey first by hearing it scurry through the grass, and the sound of crumpled paper on the floor is a good approximation that will stimulate the cat to chase and hunt. Often this can turn into a game of knock-hockey with the crumpled paper; you should definitely join in. It might be cute to see a little kitten batting at your fingers and trying to bite you with her tiny teeth, but when she’s a full-grown cat it won’t be cute at all. It’s much more difficult to train an adult cat out of this behavior than to prevent it, so be sure to tell anyone who visits your cat to use a toy and not their fingers or toes. Watch how fast the cat gets under this “tent.” In fact, just being in the tent is exciting to a cat. But the game gets even better when you wiggle a cat toy under the edge of the towel (a feather works particularly well here) or ripple your fingers along it. 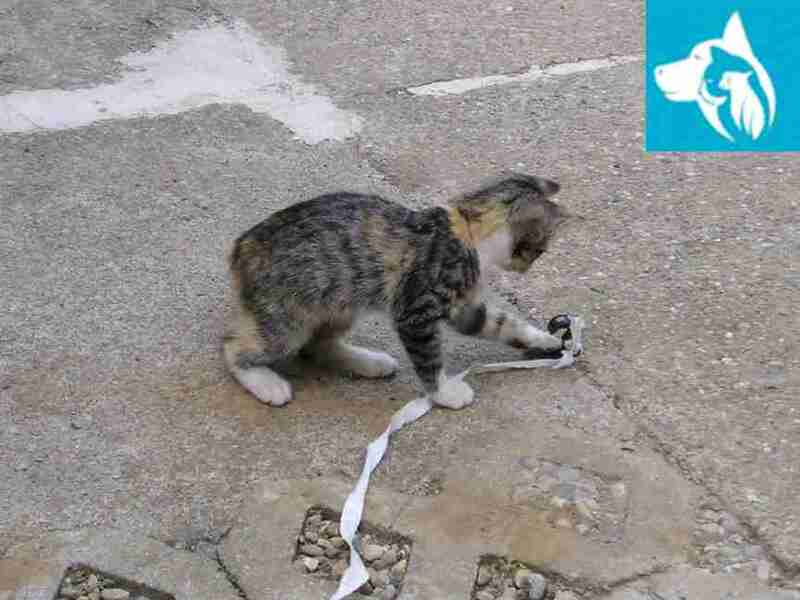 HuffingtonPost says that chasing is a form of kitten play that many cats continue to love as adults. Often they will solicit the game by standing at the end of a long hallway and looking back at you repeatedly as they take a few steps. Many cats also have specific rules about how the game of chase should be played and how far around the room or down the hall they should be chased. They will look back at you or verbally complain if you don’t follow the rules of the game. Two things to remember about chase: the cat’s tail should be up while she’s running as a sign that she’s enjoying the game (a lowered tail can mean she’s running because of fear). And while chasing is great exercise (for both of you), the cat also needs a form of play that will engage her mind and her hunting instincts. According to Vetstreet, cats chase small prey and people because it’s their instinctive behavior as they’re natural born predators.